Put on your bowtie, slap on your fez and head out to Beacon, New York, where there seems to be a Dr. Who-themed restaurant called Pandorica. News of a Whovian destination hit Reddit thanks to user jacquelinesarah, who chronicled her trip to the location with some images uploaded to Imgur. And yes, as the fan proclaims, the restaurant is indeed bigger on the inside. 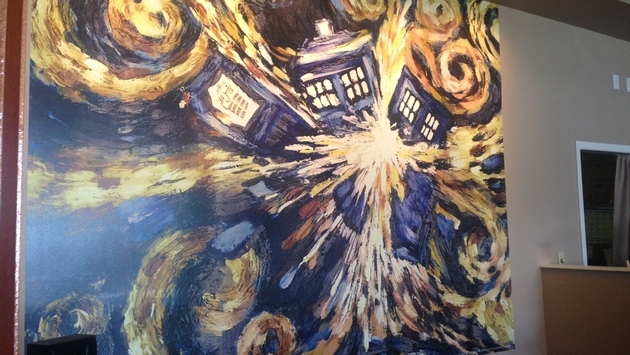 It features Tardis décor and a giant Vincent van Gogh-inspired painting of a Tardis exploding. Fans in the area will want to head to the restaurant’s Facebook page, which features a great deal more images and information. As Whovians know, you never want to be caught in the fictional Pandorica, possibly locked up for centuries as a Roman centurion stands guard. However, the real Pandorica looks like a pure delight, offering up British fare along with the clever whimsy you should expect from anyone who has spent countless hours following along with the good Doctor. In fact, we now have a hankering for fish fingers, because fish fingers are cool. Not that we need to remind you, but the next iteration of the Doctor will premiere on Saturday, Aug. 23 at 8 p.m. EST on BBC America, which is precisely the time my own Dr. Who shot glasses and sonic screwdriver make a cameo on the coffee table. This is also the moment that I will be most jealous of you who are close to Beacon, able to exterminate that hunger like a Dalek trying to end the world. Now if you do decide to go, perhaps consider taking a banana as well.